In early December 2016, the eighteenth-century Buddhist painting Five Buddhas went back to its original home in Korea, after a sojourn of thirty years in the home of Robert and Sandra Mattielli in Portland. A civilian employee of the U.S. Army, Robert Mattielli had lived in Korea from the 1950s through 1980s, during which time he avidly collected Korean arts and crafts. He discovered the Five Buddhas in ruinous condition at an antique shop in Seoul in the mid-1970s and bought it for ten dollars. He had it carefully cleaned and mounted and proudly displayed it in his dining room in Seoul until 1987, when he and his wife Sandra returned to Portland. Left to right: Sandra Mattielli, Robert Mattielli, Venerable Ja-seung, Brian Ferriso, and Maribeth Graybill at the Jogye Buddhist Order Headquarters in Seoul, June 20, 2017. Photo courtesy Jogye Order of Korean Buddhism. 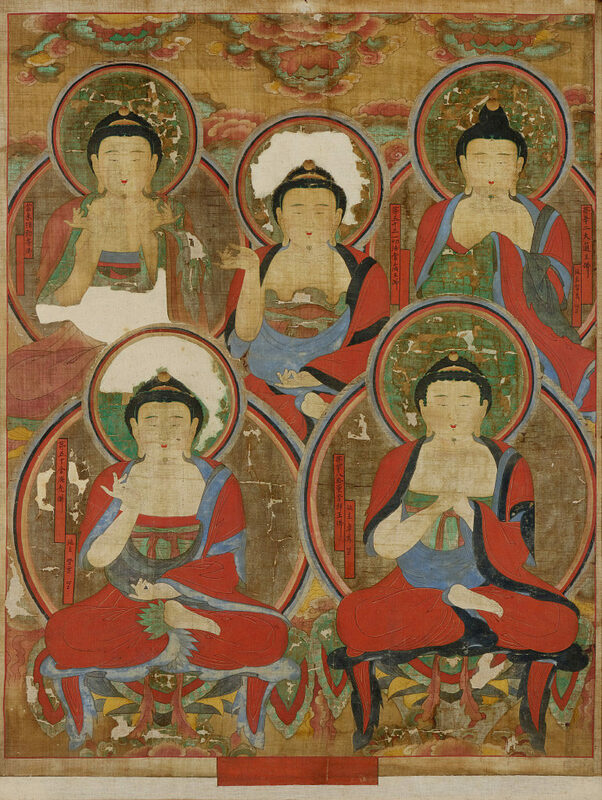 In the summer of 2014, the Five Buddhas was on loan to the Portland Art Museum when a team of scholars from Korea’s National Research Institute of Cultural Heritage came to survey the Museum’s holdings in Korean art. They greatly admired the painting, but several months later they reported that it was in a list of paintings stolen from Songgwangsa, one of Korea’s most famous monasteries. 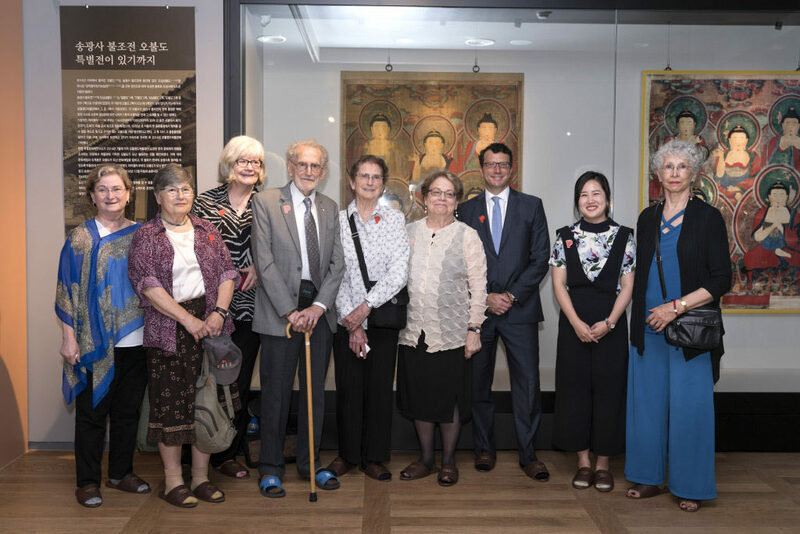 When the Mattiellis heard the news, they readily agreed to repatriate the painting, and the Museum worked with them and the Korean Cultural Heritage Administration (CHA) to facilitate the process. With funding from CHA and the Mildred Schnitzer Memorial Fund, the Museum hosted a special exhibition of the Five Buddhas, culminating in a symposium on December 3, 2016. The return of Five Buddhas marked a significant moment in U.S.-Korean cultural relations as a model of cultural heritage repatriation. By willingly donating the painting to the monastery, the Mattiellis won profound honor and respect in Korea. In gratitude, Songgwangsa invited them, as well as Museum Executive Director Brian Ferriso, Curator of Asian art Maribeth Graybill, and me (Curatorial Fellow in Asian Art, Sangah Kim) to visit Korea to see the painting installed in a new museum at the monastery. 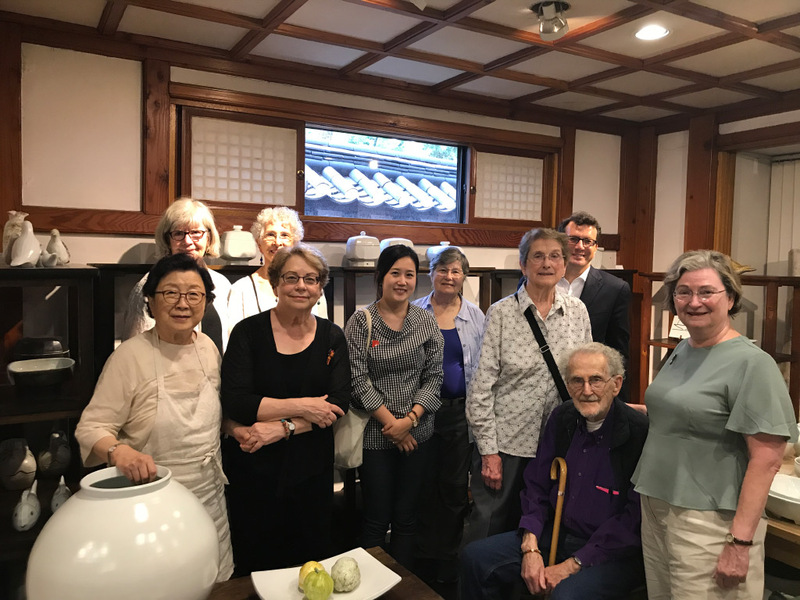 The five of us, along with Jan Quivey, Ré Craig, Sylvia Lurie, and Barbara Trudel of the Asian Art Council, flew to Korea in June 2017 for a week-long trip. In that short time, we packed in a crowded schedule of visits to ancient palaces, modern museums, and artist’s studios, not to mention a fabulous selection of restaurants! 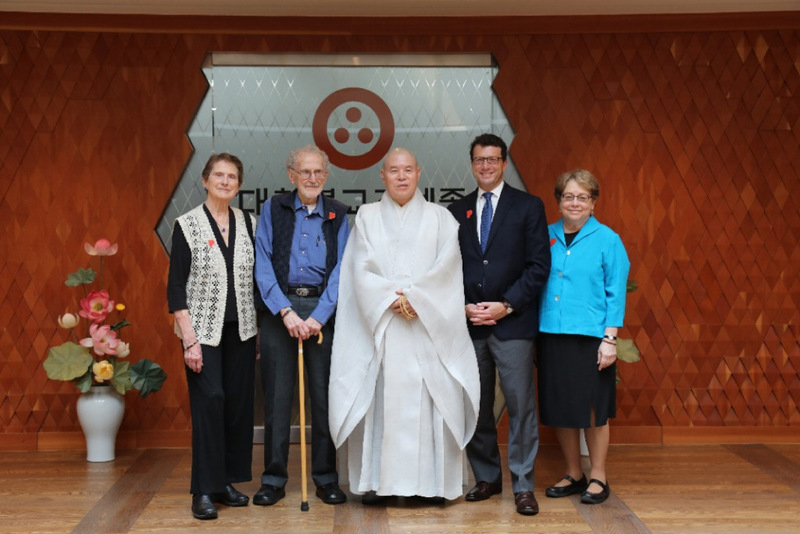 On the first morning in Seoul, the Mattiellis, Brian, Maribeth, and I paid an official visit to the Seoul headquarters of the Jogye Order Korean Buddhism, the sect to which Songgwangsa belongs. We were warmly welcomed by Venerable Ja-seung, the head of the Order, and interviewed by eager reporters from major media agencies. The next day, Robert’s photo and the story of the repatriation of the Five Buddhas was featured in dozens of newspapers and on TV, reaching an audience of nearly 25 million people! That same day, our group enjoyed a private tour of Changdeokgung Palace, the less formal of the two royal palaces in Seoul. Robert and Sandra Mattielli reminisced about how they used to visit a member of the royal family who lived there, during their years in the capital. 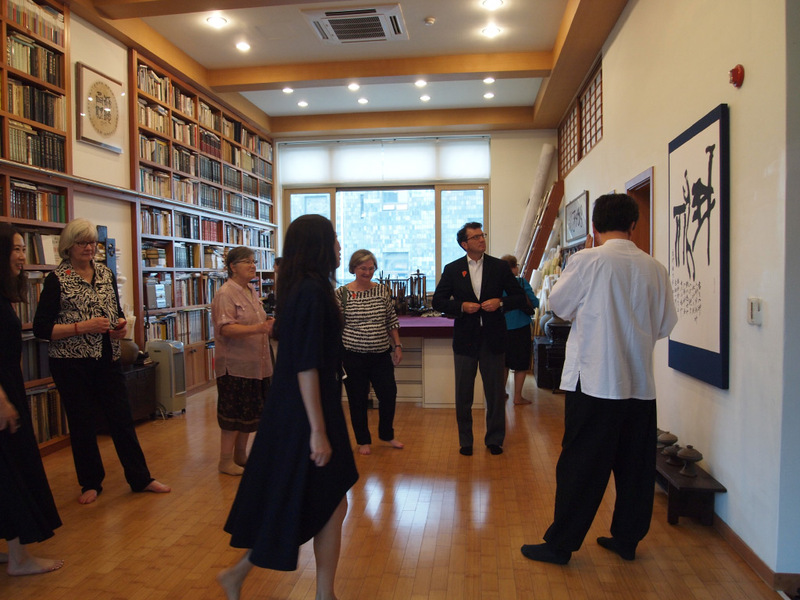 After a lunch, we crossed town to visit the spacious studio of renowned calligrapher Jung Do-jun. At the studio of calligrapher Jung Do-jun, Seoul, June 20, 2017. Photo by Sangah Kim. June 21st began with a visit to the National Museum of Korea (NMK) to tour the collections galleries and the conservation studio. The NMK recently awarded the Museum a special grant to conserve seven important works of Korean art from our collection in their workshop, a process that will take place in two phases over the next three years. Phase one is the cleaning and remounting of two important embroidery screens—both of which came to the Museum from the Mattiellis. We examined the screens together with NMK staff and learned about their plans to restore these masterworks. 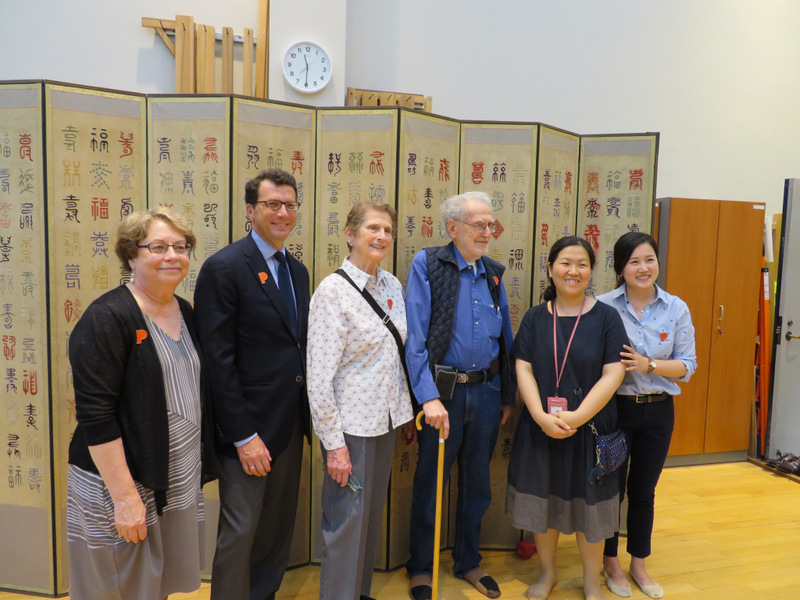 Left to right: Maribeth Graybill, Brian Ferriso, Sandra Mattielli, Robert Mattielli, Conservator Jang Yeon-hee, and Sangah Kim in front of PAM’s Subok embroidery screen, in the conservation studio of the National Museum of Korea, Seoul, June 21, 2017. After lunch with curators, educators, and conservators at NMK, we visited the very impressive museum of Korea University, home to an important collection of Korean paintings and ceramics. 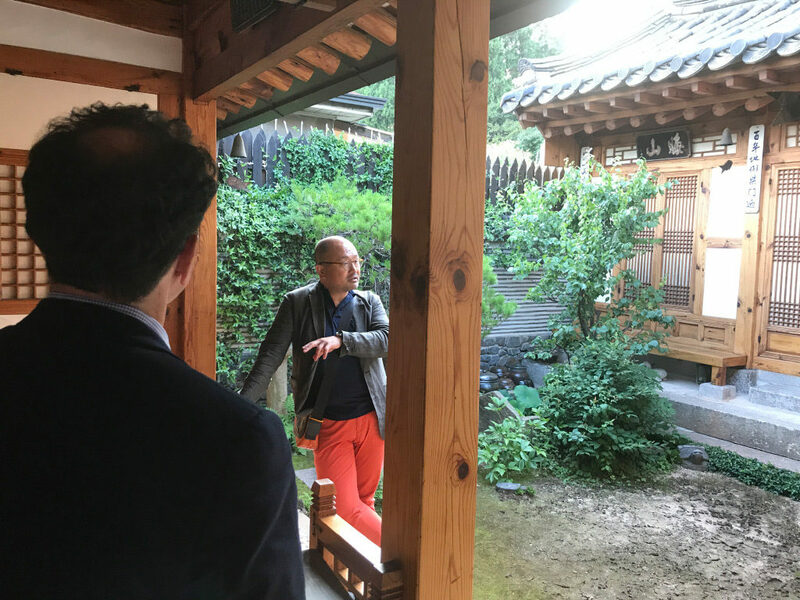 The day concluded with a special talk by architect Hwang Doojin and his guided tour of Bukchon, a historical district of traditional residential architecture. Architect Hwang Doojin explains his work as a restorer of hanok, traditional Korean houses. Seoul, June 21, 2017. Photo by Sangah Kim. On June 22nd, after a visit to the spectacular Leeum Samsung Museum of Art—a private museum with a superb collection of traditional and modern Korean art, as well as global contemporary art—we headed south by train and bus to visit Songgwangsa monastery. Nestled among pine-covered mountains in the southwestern part of the peninsula, Songgwangsa has been an important center for training monks for nearly a thousand years. The beautiful temple grounds are a place of pilgrimage for those seeking escape from the dusty concerns of the world. We too were transported to new realms of delight by the incredibly warm hospitality of Abbot Jin-hwa and the monastic community. At the entrance to Songgwangsa, Venerable Il-hwa (third from left), Director of General Affairs for Songgwangsa, and Venerable In-seok (second from right) welcome the Portland group. A banner reading “Welcome Mr. & Mrs Mattielli and Friends from the Portland Art Museum” graces a newly build gateway. June 22, 2017. Friday June 23rd was spent entirely at Songgwangsa. Venerable Hyun-bong, a former abbot of the monastery, personally guided us on a tour of temple grounds. It was deeply moving to visit the Hall of the Ancestors, where the Five Buddhas painting and others icons from the same series were originally housed. 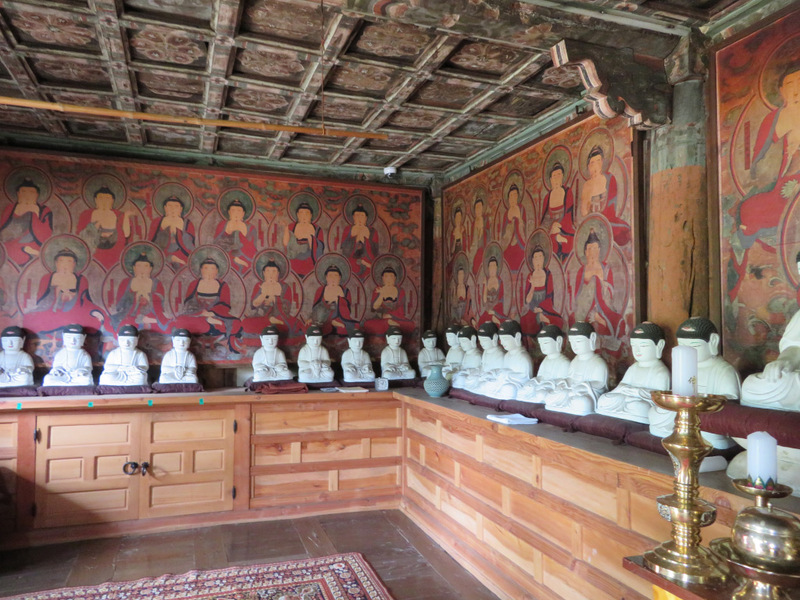 The Hall of the Ancestors at Songgwangsa, now furnished with modern replicas of painted and sculpted Buddhist icons. June 23, 2017. Photo by Maribeth Graybill. Then at last we were able to see the Five Buddhas it its new home—the monastery’s newly built museum. Our visit to the monastery coincided with the opening of a special exhibition of Songggwangsa’s many cultural treasures, with pride of place going to the repatriated painting. Once again, Robert was the star, surrounded by photographers and reporters eager to hear about his days in Korea as a collector. 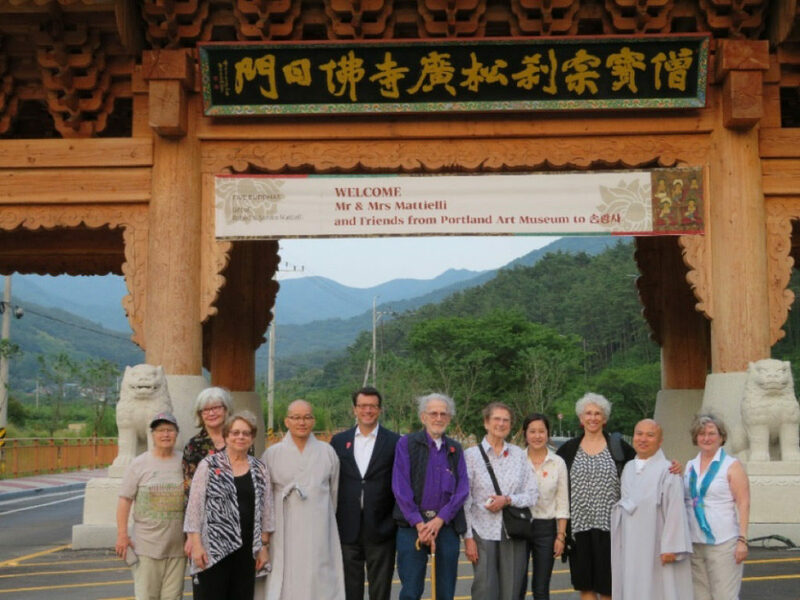 The Portland Art Museum group in front of Five Buddhas installed in the Songgwangsa Monastery Museum. From left: Barbara Trudel, Sylvia Lurie, Jan Quivey, Robert Mattielli, Sandra Mattielli, Maribeth Graybill, Brian Ferriso, Sangah Kim, and Ré Craig. June 23, 2017. Photo courtesy Songgwangsa (photographer Dongyeong Yu). That afternoon, scholars presented new research on the icon from a variety of perspectives. (Happily for us, Songgwangsa had prepared translations in English in advance!) The high point of the afternoon came with a special signing of a Memorandum of Understanding between Songgwangsa and the Portland Art Museum, promising to collaborate on cultural exchange in the future. 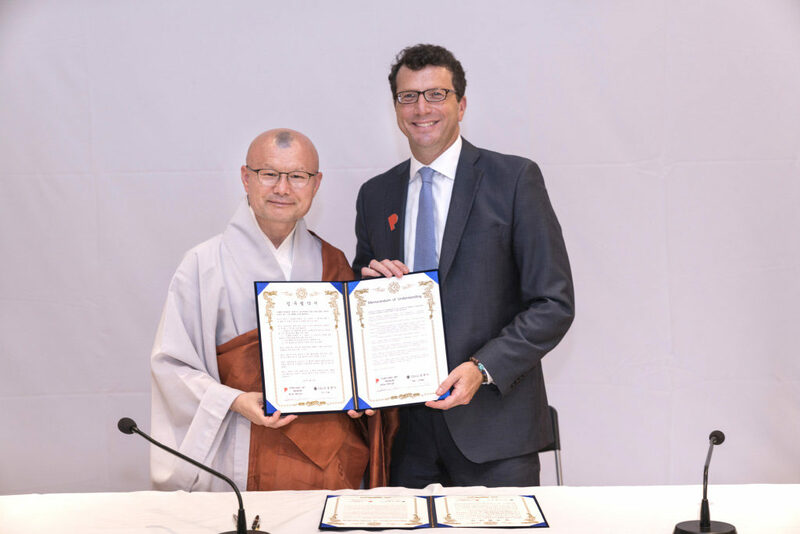 Songgwangsa Monastery and the Portland Art Museum sign a MOU agreeing to future collaboration. Venerable Jin-hwa, Abbot of Songgwangsa and Brian Ferriso, PAM Executive Director. June 23, 2017. Photo courtesy Songgwangsa(photographer Dongyeong Yu). On Saturday morning June 24th, we bid a fond if sad farewell to our new friends at Songgwangsa and returned to Seoul, each of us laden down with precious gifts from the monks. Back in Seoul, our primary destination for the afternoon was the studio of Kim Yikkyung, a famous ceramic artist whose work is collected by museums around the world. Then it was off to a fabulous dinner! Kim Yikkyung’s studio. The artist is at the far left. Seoul, June 24, 2017. Sunday June 25th was a day for shopping and packing and a parting of the ways. Some of us caught a return flight that evening, while others stayed on for more sightseeing in Gyeongju, the beautiful capital of the ancient kingdom of Silla in southeastern Korea. Eventually, everyone returned to Portland, safe and sound and rich with memories. The Five Buddhas and its companion paintings will be registered as a Cultural Treasure of Korea in the near future, an acknowledgement of the work’s exceptional aesthetic merit and historical importance. What would have been the fate of the Five Buddhas if Robert Mattielli hadn’t noticed it, tattered and filthy, in the back corner of an antique shop in Seoul, more than forty years ago? Who could have foreseen the icon’s long journey, to Portland and then back to Korea again? And who would imagine that this painting would create a bridge of friendship between Portland and Korea? I believe that the journey of the Five Buddhas was no coincidence, but a manifestation of karmic destiny (or in-yeon, as we say in Korean). It was a ten-dollar miracle.